Meet Dave Schratz, who earns money on the web by sitting in front of his 80K+ followers eating his first and only meal a day. Every night he tries to vary his menu. Once we’ve seen him shoveling into his mouth cheeseburger sliders. Some days ago that was 12 bacon-egg-cheese sandwiches and a pile of fries, or it may be a bulging-at-the-seams fajita plate. 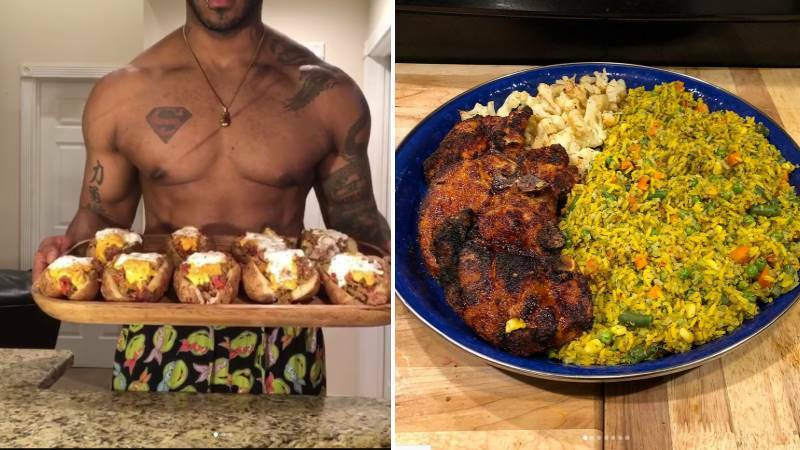 The 32-year-old blogger claims he eats one time per day and this meal consists of thousands of calories. He claims that every portion contains about 3,700 calories, remaining him lean. For us to be confident in his words, Dave proudly displays his muscular body in weightlifting videos on Instagram. It’s also worth mentioning that Dave sometimes has 2-hour daily workouts which are also a part of his Herculean physique. “People don’t see the vegetables that I eat, but I usually eat pounds of vegetables with every meal. And people don’t notice because they’re covered in cheese,” he says in an interview for Men’s Health. And that’s true, his diet isn’t unhealthy, as he doesn’t drink liters of sugary drinks. What is more, Dave looks after his macro nutrition, which shares with his followers in each post. To sum up, when choosing the way to follow you have to remember the next thing – the best way for you is to keep your minds tight and follow your heart. If you want to eat once per day – just do it, if want to eat seven meals per day, try this option as well.